Things are moving along on the safari project. I'm happy with my two piece sleeve, so here's where things stand. From the front I'm pleased with the fit across the chest. For once there doesn't appear to be any need for a shoulder adjustment. 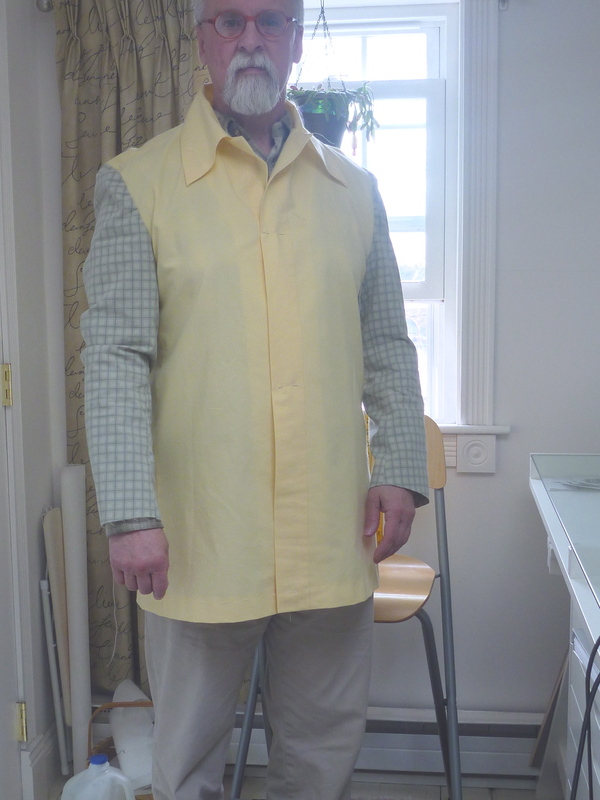 I did think the fit was too snug at the waist and below so I let the front / side seam out by 1/2" on each side. The extra inch of ease at the front made a huge difference. BTW the left sleeve is the final version. The back is a bit baffling. It's times like this that I wish I had a sloper. There seems to be too much fabric at the back / shoulder and I just don't know what to do with it. I've learned by making the muslin that the sleeve has to be eased like crazy. 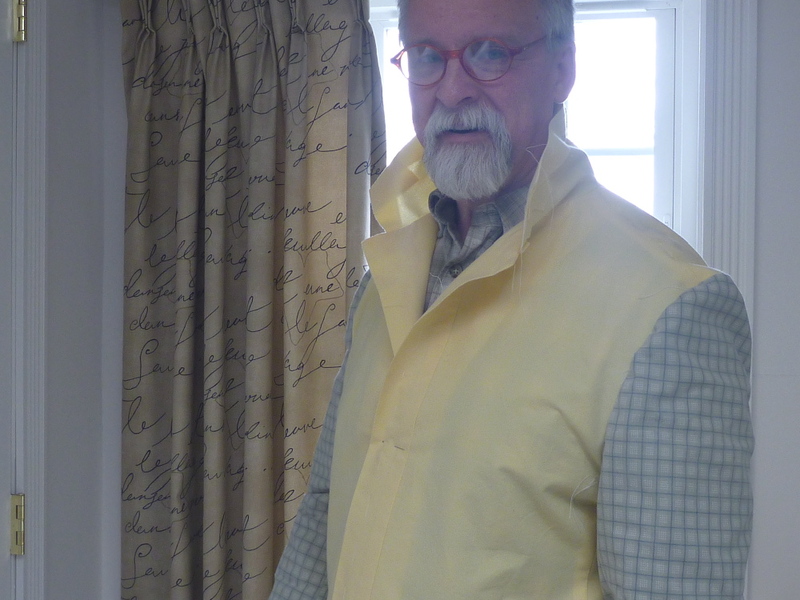 I keep reminding myself that I'm working with a bed sheet and that my fashion fabric will have more "oomph". I'm also planning a full lining and wool sleeve heads which will hopefully give me more structure and support to the back shoulder area. If that doesn't work I'm afraid the back will look rather "slumpy". Here's hoping my plans work. 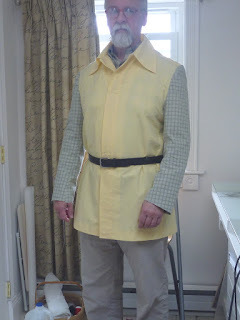 I wrapped a belt around myself to get the gist of the finished garment. Eeeek Maybe this has been a big mistake. BUT, I'm very happy with the set of my left sleeve! I keep repeating "it's just a bedsheet muslin." Here is the original collar. Very Saturday Night Fever. Here's my whittled down version which I hope will work. I took 1/2" off the width and eliminated the extreme "pointiness" of the original. It's more obvious on a hanger. 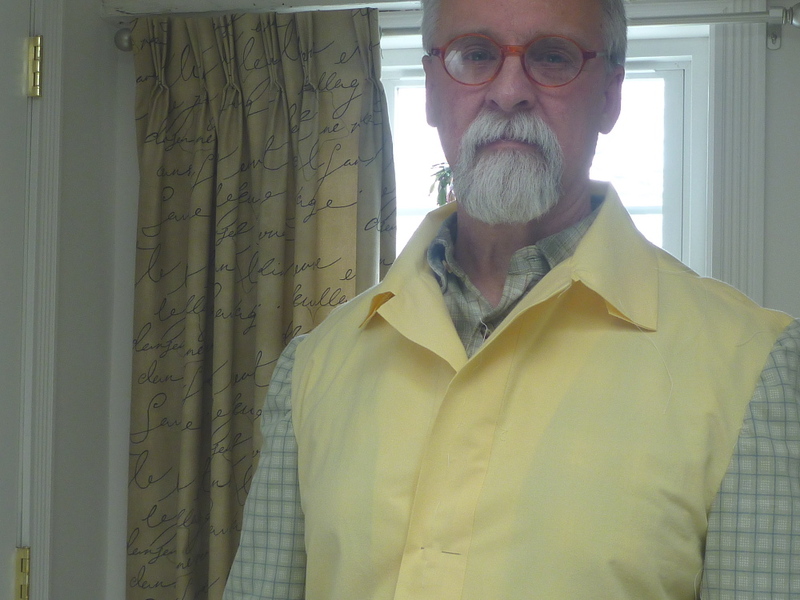 I can flip the collar up without it coming half way up the back of my head! I'm sure there's more I could do to improve the fit, but I'm ready to move on. As always making a muslin has been well worth the effort and the $2.99 Goodwill sheet. What have I learned? 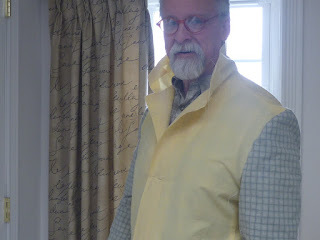 I will have to be extra careful setting the sleeves and adjusting all the ease. 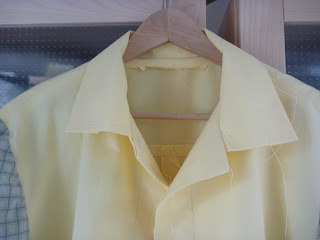 I will also struggle getting the collar positioned correctly. 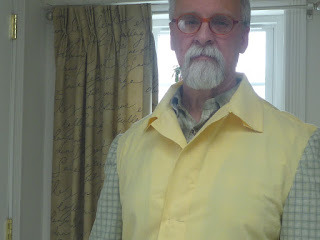 The pockets will, of course, be time consuming, but the rest should go together easily. I think the back ease is designed to work w/ a belt, it doesn't look "wrong" to me. Maybe you just have "wrinkle-itis" like all of the rest of us ;-). 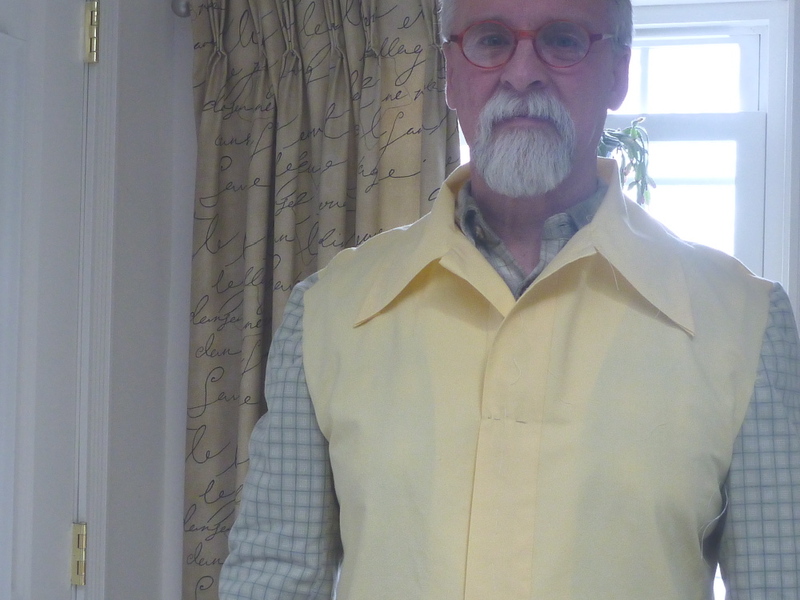 Your muslin looks good, can't wait to see the end result. Is it possible the rear shoulder is drafted with a bit less slope than the front? It does seem to be collapsing a bit. Although the final shoulder-pad may help with that. The second sleeve looks great, although if there is too much ease I wouldn't hesitate to shave it down a bit. Other than that, I think it looks great! 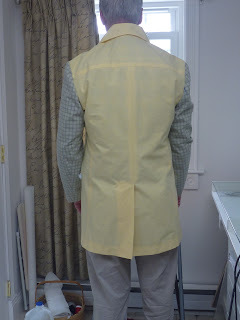 I like to slip in shoulder pads to visualize the final fit in the shoulder area; it does make a difference in smoothing out those back shoulder wrinkles.